Todd Rosenthal’s set for The Steadfast Tin Soldier resembles an extravagantly wrapped Christmas present. Delicately placed inside the Lookingglass space, it’s a person-sized toy theatre, framed by a festive miniature proscenium and sporting an advent calendar in place of a curtain. (There’s even a small orchestra pit.) It’s the kind of gorgeous creation that, in lesser hands, might come across as fussy: meticulousness for its own sake. In the masterful grasp of Mary Zimmerman, however, it’s a yuletide delight: a gift so beautiful, you’d almost hate to open it. 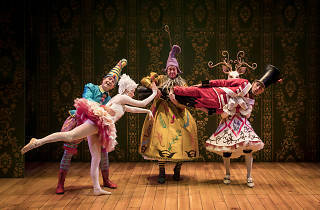 Based on Hans Christian Andersen’s fairy tale, The Steadfast Tin Soldier is a spectacle that draws heavily from the British tradition of Christmas pantomimes. There is practically no spoken dialogue; instead, the action is set to a score composed by Andre Pluess and Amanda Dehnert for piano (Leandro López Várady), violin (Greg Hirte), cello (Michal Palzewicz) and woodwinds (Constance Volk). As its story unfolds in a brisk 60 minutes, the show reveals a knack for inventive variations within its basic pattern: Execute charmingly whimsical contrivance, rinse, repeat. True to his name, the solder remains staunch through it all—even when, quite frankly, a little less steadfastness and a bit more cutting and running might serve him better. In fact, the less you think about the story’s stiff-upper-lip moralizing, the better. 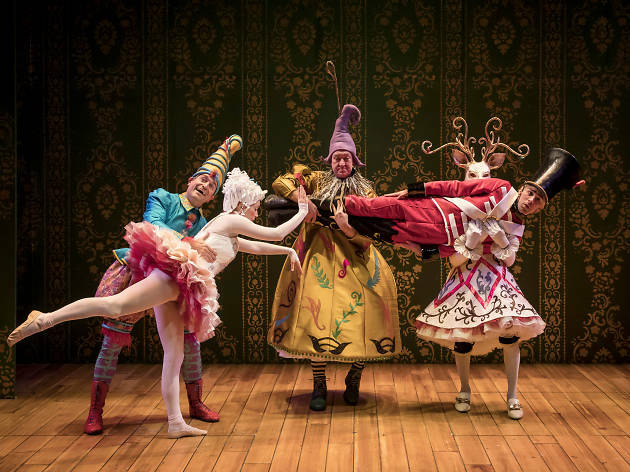 (Maybe it’s just the holiday season talking, but I’m pretty sure this show called me a “snowflake.”) Instead, let yourself be dazzled by Blair Thomas and Tom Lee’s exquisitely wrought puppets, Ana Kuzmanic’s lavish costumes and Zimmerman’s playfully creative staging. Faced with pleasures such as these, the most cynical heart will melt. Lookingglass Theatre Company. Conceived and directed by Mary Zimmerman. With Anthony Irons, Christopher Donahue, Kasey Foster, John Gregorio, Alex Stein. Running time: 1hr. No intermission.